R.I.D.E.R. strategy is an effective strategy that enable to recall information from a text and paraphrase this information is one way to monitor comprehension (Clark). 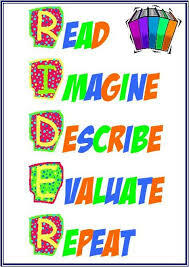 The R.I.D.E.R. Strategy is a strategy that encourages interaction with a knowledgeable other, modeling the strategy in a non-threatening way and assisting the student to use the comprehension strategies. It is anticipated that metacomprehension would develop so the student will automatically visualize text, and use ‘fix-up’ strategies what they encounter a mismatch. Gradually the student would be able to do this independently. Furthermore, the R.I.D.E.R. Strategy is a strategy that can assist the students in reading comprehension. It can encourage students to image the whole picture, which may include locations, characters/people, facial expressions and environmental factors and cue them to describe what they see. a. Teach the students the steps involved in RIDER. Tell them they will be making pictures in their mind about the text. b. Select a text for the student to listen to or to read. Get the student to listen to or read a short section of the text and cue them to develop a picture as they listen/read. c. Ask them to describe their picture. Discuss this within the group. d. Get the students to listen to or read the next section of the text. Ask them now about their “picture”. Has it changed? How? e. Keep working trough this sequence to the end of the text. And the self questioning procedures of Who, What, Where, When and Why would allow students to read a passage, create visual images and then form questions about the content of the passage as they read. In this way they would maintain interest and enhance the recall of their students. c. Summarising and analysing stories read. Belum ada tanggapan untuk "RIDER Strategy in Reading"